No matter what level of success we have achieved, none of us can be content to stay where we are. In order to harness this drive, this innate desire for progress in all areas, we must learn to center our lives according to a set of certain basic principles. Stephen R. Covey, author of the runaway bestseller The 7 Habits of Highly Effective People, tells us how to apply these principles to the problems we face every day. Drawing on his 25 years of teaching and consulting experience, Dr. Covey shows us how to avoid the pitfalls of ineffective people, and at the same time how to meet the goals of all strong business leaders: quality, productivity, profitability and establishing win-win relationships. 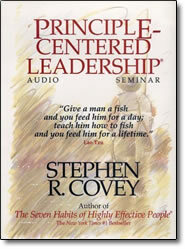 Using the same insightful and sensitive style that made The 7 Habits of Highly Effective People a #1 national audio bestseller, Principle-Centered Leadership provides the keys to life-long learning — each one unlocking the doors to personal fulfillment and professional success. How can I achieve and maintain balance between work and family, and between the professional and personal areas of my life? How do we unleash the creativity, talent, and energy of the majority of our work force, whose jobs neither require nor reward such resources? How do we create team spirit and harmony amidst scarce resources, political games, and hidden agendas? How can we understand that the choice between “hardball” and “softball” management can be transcended by a Third Alternative™ that is tougher and kinder? How can we create a culture characterized by change, flexibility, and continuous improvement, and still maintain stability and security? How can we ensure that our employees are aligned with our organizational strategy, so everyone will be as committed to it as its creators? How can the people in our organization internalize the principles of quality and improvement when they are disillusioned with past “programs of the month”? How can we create a complementary team based on mutual respect when so few of our employees value diversity? How do we turn our mission statement into a constitution — the organization’s guiding force — instead of a collection of meaningless platitudes?